Apparently, since I started working this month, I’ve not only my ability to type normally on my macbook, with the regular international keyboard (I work on a German keyboard at work), I’ve also grown really fond with the start-up culture, and thereby becoming a snob. My previous full-time employment was at a large company with over 15,000 employees worldwide, with a brand name everybody knows. My current company is officially about 2.5 years old and is projected to break even this summer. It’s very strange, very amusing but very fascinating. I thoroughly enjoy seeing increasing success just within these three weeks of being there! H works at a huge company, so they have a budget for everything. While currently enjoying his two weeks off from accumulated overtime (Start-uppers be laughing at this), he told me about his dinner event with his department that would take place tonight. H: So we can’t have dinner together tonight. I: Oh ok. Hmm I feel like we haven’t cooked for a while. I miss cooking. H: We’ll be cooking tonight. I: Really? At a colleague’s place? H: No, at a cooking studio. Another part of living together makes you experience things as simple as potato-cooking. So finally, yesterday, I decided to let go. I placed more potatoes in the pot than I was comfortable with. I: Na? Ich hoffe, die Kartoffeln sind genug für dich, mein Lieblingskartoffelnesser! S: Awwwwwww, so sweet!! Danke, meine Lieblingskartoffelnkochin! I: Ohh, deine Mutter wird nicht glücklich sein. I had an interesting day. It involved some other guy’s privates. But that’s a story for another day. So we had to make dinner (we ate in a restaurant perhaps only once that week, but also a bar, a cafe, etc). We flipped through the recipe book, made a note of the ingredients, added what we wanted for the impending road trip to the grocery list, plus what he wanted in his fridge to feel homely, voila, it was an exhaustive list. He drove us out to a different commune, Labège, where they had a mall with a huge supermarket. And to our delight (as it was late), it was open till rather late. As we went down a third of the grocery list, they made an announcement that the store was closing. We ended up splitting the list and making a dash for the items (think Amazing Race), and meeting back in the center. I wrote the list so I knew what was on there, but he started popping meringues into our shopping carts, and was frantically looking for frozen raspberries. I: Why do we need raspberries and meringues? I: What are we making? S: (with glee) It’s a surprise. That was a long intro to the dessert, I’m sorry. I’ve no idea what it is called but it’s the easiest thing to make, and I’ve no picture of it – neither can I find it online. So in the bowl, fill a good layer of frozen raspberries, then shower it with the crushed meringue pieces, then a layer of cream, and top it with chocolate chips. Put it in the fridge for half an hour and it’s perfect for eating. What we find is that if you take it out (and it melts) and you put it back into the fridge – the next time you take it out, you won’t taste the crunchy tiny meringue bits anymore as they’re probably melted. Still it’s amazing. What I love is the sweetness of the meringue and chocolate chips and the sourness of the raspberries. And I love raspberries. Is this not the simplest dessert to make or what?! Unfortunately when I wanted to replicate it here, meringue couldn’t be found and a bag of raspberries tinier than what we got costs S$14. No, thank you. Happy to share a recipe that my cousin and I came up with today. We were inspired by this recipe to create matcha green tea brownies. Unfortunately, it wasn’t quite what we had expected, possibly due to the type of white chocolate used, the type of matcha powder used, and so on. I’m not a fan of brown sugar either, so our first batch following the recipe came out not ideal. Nevertheless, it was still alright – tasted like white chocolate cakelet instead. 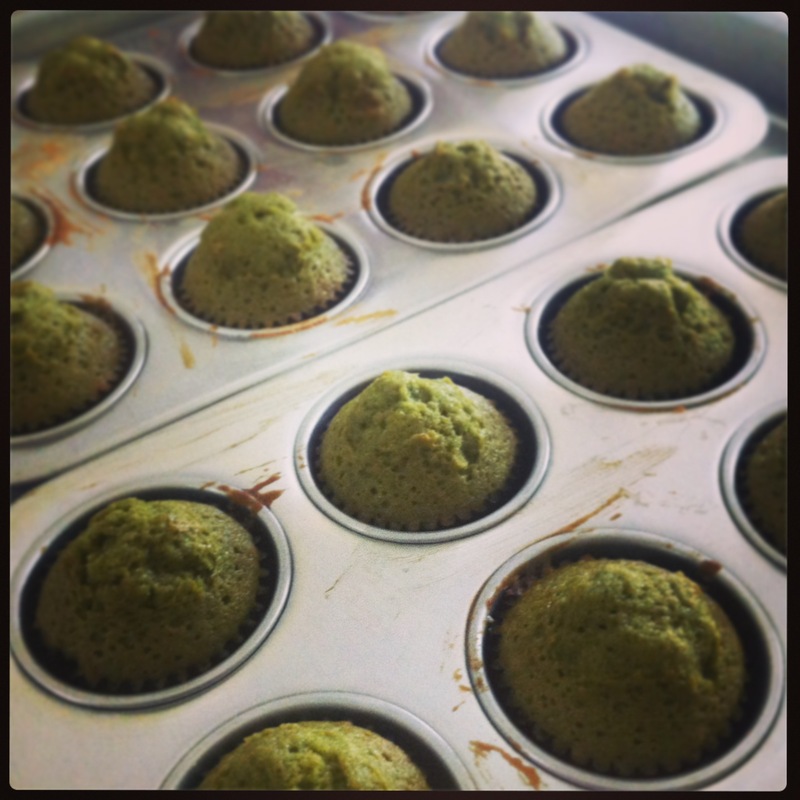 Sift flour, baking powder and matcha powder together in a bowl. Melt white chocolate over a double boiler, and place butter in microwave to melt (medium heat, 1 minute), then mix them together along with the eggs. Bake in oven for 15 minutes. Rotate the tray around and leave it in for another 2 minutes. Set it aside to cool. Makes about 20 mini bites. This Friday, I’ll be lying on the cold operating table, getting cut open. Ok, it’s not as bad as it sounds – I’m getting my wisdom teeth out. Two to be exact. Two damn molars on my lower jaw. The jaw that be mighty obviously swollen. But the surgery comes with medical leave, and so while I’m hiding out from the public eye and cooped up at home, I need to make two lists. One of the things I could do while cooped up, and one of the things I could consume while I’m unable to chew.